Olympic inspired nails & exciting news- Manicure Monday | S J M W E L L - Fashion, Beauty & Lifestyle blog. 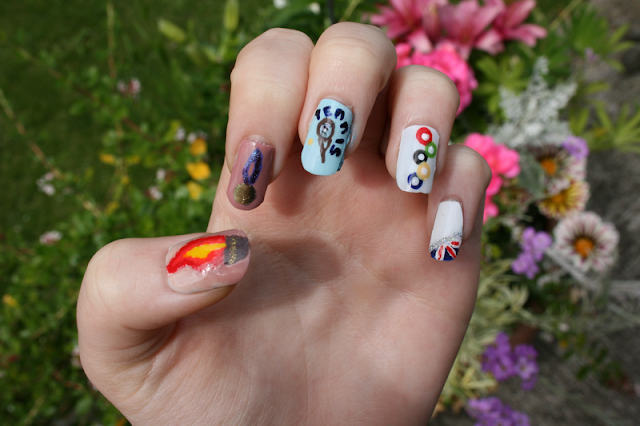 First photo: 'Ombre Olympic torch', Gold medal, Tennis, Olympic Ring's, Quarter of the Union flag. Phew, that's alot of polishes! 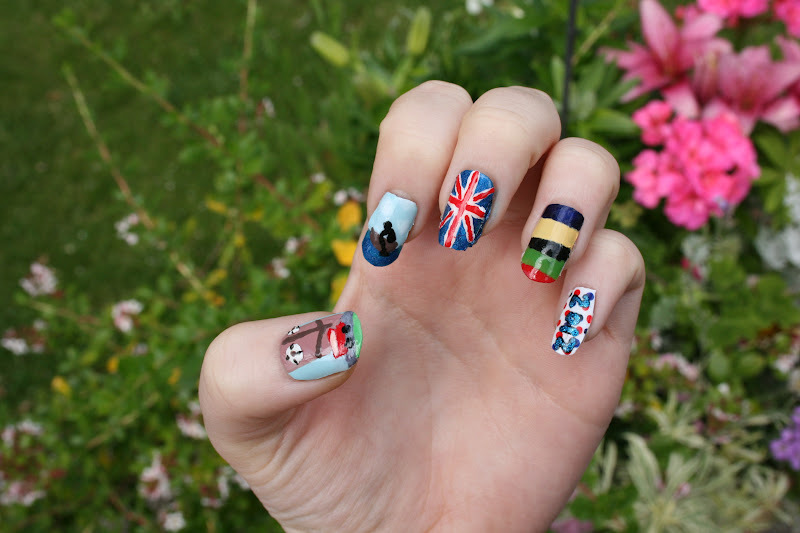 A few week's ago Collection announced they're running an Olympic themed nail art competition for blogger's. Of course I jumped at the chance to get involved, I love nail art! All you had to do was create design's on your nail's, use at-least two nail polishes from their range and send them in. You could create as many nail's as you wanted but only one could be accepted per person. The Collection team would then choose their 5 favourite design's and upload them to their facebook page and allow fan's to choose their favourite to win by 'liking' and sharing the photo. I started by wanting to do the obvious e.g the Olympic ring's and possibly the Union flag, but I also wanted to 'try' and do something different. Annoyingly the day before i went to paint my nail's they broke so i had to cut them short :( mad dash to get some blank false ones from the shop as mine were impossible to do anything on, They still took me forever to paint on myself though. Well, I found out my entry was chosen as one of the 5, I was so excited! I didn't think mine would get chosen at all. The voting start's today (23rd July) on their facebook page and voting will run until Tuesday 31st July. If any of you would like to see any tutorial's on how I did any of the nail's or what polish was used for which nails let me know in the comment's! I posted how to do 'ombre' nail's here the other day, I used exactly the same technique for the 'flame torch' thumb. Please click here to 'like' my photo if you like my nail's!